Writer Roger Stern revisits old friends this June with his new novel, Superman: The Never-Ending Battle. 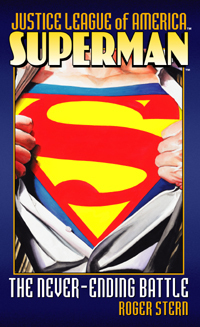 Stern's 1993 debut novel The Death and Life of Superman quickly became a New York Times bestseller. In returning to the cast of that first book, the writer says that he found part of the inspiration for his new novel in recent newspaper headlines. "The Never-Ending Battle is an action-adventure story, peopled by fantastic beings, but the threat they face is global terrorism," says Stern. "Superman and his teammates in the Justice League of America must hunt down the mysterious leader of a worldwide cult who is working to destroy civilization. That's not easy, even for Superman. And what makes it especially difficult is that this particular cult leader has found a way to use the world's weather as a weapon." Superman: The Never-Ending Battle is a defining tale of the legendary Man of Steel, delving deeply into the life of the man behind the myth and exploring why he risks his life again and again. "Still, at its heart, it's a love story," adds Stern, who notes that Clark Kent and Lois Lane were engaged at the time of The Death and Life of Superman. "Now Clark and Lois are newlyweds, with all that entails."